In this blog post, we will learn how to build a simple iOS app menu (shown below) using Test-Driven Development in Swift. Familiarity with XCTest. If you have never used XCTest before, please read the XCTestCase section from Matt Thompson’s blog post on the topic. Create a new iOS project in Xcode 6. Select the Single View Application template. Use AppMenu for Product Name, Swift as the language, and iPhone for Devices. Make sure the Use Core Data check box is not selected. For this exercise we won’t be using Storyboards. So delete the Main.storyboard file. Don’t forget to remove the storyboard name (Main) from the Main Interface drop-down located in Deployment Info section under General tab for AppMenu target. While we are at it, let’s delete ViewController.swift and AppMenuTests.swift files as well. They were created by Xcode and we won’t need them. Before we embark on this beautiful journey of Test-Driven Development (TDD), let’s step back and think about the app design a little bit. You might have heard that TDD is more of a design exercise than a testing activity. If so, you have heard it correct. TDD forces us to use the code even before it exists through tests which in turn forces us to think about how the class under test interacts with the rest of the code in an application. This act of using code we wish we had helps us make (good) design decisions that lead to the creation of reusable classes and easy-to-use application programming interfaces (API). That being said, it is not always guaranteed that an application built by writing tests first is well designed. We still need to apply good design principles and patterns in addition to writing tests first. The figure below shows the initial design we are aiming for. If you are worried that we might have just stepped into the Big Up Front Design (BUFD) territory, fear not. The design below gives us a starting point. We haven’t figured out every single aspect of the app yet. For example, we don’t know what the public API for each class is going to look like. As we go through the process of building the app, we might realize that we need to change the design below completely and that is perfectly fine. When I am starting on a new project, I often struggle to find the first good test to write. As a result, I resort to looking for domain objects which are usually easy to test. Our app menu will display information about each menu item for example, title, subtitle, and icon. We need an instance that stores information about a menu item. Let’s call it MenuItem. We’ll define what information a MenuItem instance contains through tests. Create a new file named MenuItemTests.swift and place it under AppMenuTests group. Right click on AppMenuTests group and select New File > iOS > Source > Test Case Class to create a new test class named MenuItemTests. Make it a subclass of XCTestCase and select Swift as the language. Delete everything in MenuItemTests.swift file except the class definition and import statements. Our first test will be to make sure that a menu item has a title. Add following test to the MenuItemTests class. In above test, we create an instance of MenuItem; give it a title; and verify that it holds onto that title by using the XCTAssertEqual assertion provided by XCTest framework that comes with Xcode. We are also (implicitly) specifying that MenuItem should provide an initializer that takes title as a parameter. When we write tests first, we tend to discover subtle details like this about our APIs. XCTest provides a number of assertions. Each assertion allows you to pass a test description that explains what the test is about. I recommend you always provide this description. As things stand right now, we are not able to run the test. It doesn’t even compile. We need to create MenuItem. Before we decide whether we should make MenuItem a struct or a class, I encourage you to read the Choosing Between Classes and Structures section from The Swift Programming Language Guide first. At a first glance, struct might seem sufficient here. However, in Handling Menu Item Tap Event section below we will need to store a menu item in a NSNotification object. NSNotification expects an object that needs to be stored in it to conform to AnyObject protocol. A struct type doesn’t conform to AnyObject. Therefore, we need to make MenuItem a class. Create a new file named MenuItem.swift (File > New > File > iOS > Source > Swift File). Add it to both AppMenu and AppMenuTests targets and replace its content with following. You shouldn’t have to add application classes into test targets, but there seems to be a bug in Xcode 6 that forces you to do so. Otherwise, you will get use of unresolved identifier error. If you receive that error in tests at any point in the future, you can fix it by adding the application class file to the test target as well. You can add a file to a target by clicking the + button from Compile Sources section in Build Phases tab. Run the test (Product > Test or ⌘U). It should pass. Let’s write a test for the subtitle property next. menuItem.subTitle = "Repos contributed to"
It should pass after adding the subTitle property to MenuItem class. It should pass by adding the iconName property to MenuItem. Before we move on, let’s refactor our tests by moving the MenuItem creation code into setup method. It is a general practice in TDD to refactor once all tests are passing. The process of refactoring helps us improve design in small increments by organizing the code and tests better. It also helps us remove any duplication. This iterative process of writing a failing test first, making it pass with just enough code and improving the design before writing the next failing test is known as red-green-refactor cycle. menuItem!.subTitle = "Repos contributed to"
XCTest calls the setup method before running each test. When a test is finished running, the variables assigned in setup method are set to nil. After that it creates brand new instances of objects and assigns them to those variables in setup method again. XCTest does this to isolate each test. We don’t want any residual data created by previous tests affect the next ones. As XCTest automatically sets variables to nil when a test is finished running, we don’t need to explicitly set them to nil in tearDown method (also provided by XCTest). That being said, if you need to do any cleanup other than setting variables to nil, you should do that in tearDown method. readMenuItems method doesn’t take any parameters and returns a tuple. The first item in the tuple contains an array of dictionaries if the file was read successfully. The second item contains an NSError object if the file couldn’t be read. readMenuItems is a required method. So any class that wants to conform to MenuItemsReader protocol, must implement it. Create a new file named MenuItemsReader.swift. Add it to both targets and then replace its content with the protocol definition code listed above. Let’s read the metadata from a plist file next. We will write tests first. Create a new file named MenuItemsPlistReaderTests.swift in AppMenuTests target. Now that you know how to create a Swift test file, I will skip those instructions moving forward. Delete everything in MenuItemsPlistReaderTests.swift file except the class definition and import statements. Our first test will be to make sure that MenuItemsPlistReader returns an error if it can’t read the specified plist file. Add following test to the MenuItemsPlistReaderTests class. We create an instance of MenuItemsPlistReader; give it a non-existent plist file name to read from; and call readMenuItems method. Then we verify that it returns an error. To make the test pass, we need to create MenuItemsPlistReader class and add it to both targets. Replace its content with following. Now run the test. It should pass. Although the test passes, something doesn’t look right. readMenuItems doesn’t even attempt to read the file. It always returns a tuple containing an empty array and not-so-useful error. This brings us to an important aspect of TDD: write minimum code to pass the test. Being disciplined about not writing anymore code than necessary to pass the tests is key to TDD. Therefore, we won’t be fixing the simingly broken readMenuItems method unless our tests require us to do so. The only requirement we have defined for MenuItemsPlistReader class so far is that it returns an error if the file doesn’t exist. We haven’t specified what should be in that error object. Let’s add a couple more tests to make sure the error contains the domain, code and description we are expecting. Apple recommends that we use NSError objects to capture information about runtime errors. These objects should contain the error domain, a domain-specific error code, and a user info dictionary containing the error description. You can add other details about the error in user info dictionary, for example what steps to take to resolve the error. Following changes to MenuItemsPlistReader should make the above tests pass. "\(plistToReadFrom! ).plist file doesn't exist in app bundle"
readMenuItems method still doesn’t look right. Next tests we are going to write will force us not to cheat. Before we move forward, delete the test named testErrorIsReturnedWhenPlistFileDoesNotExist. It is made redundant by previous three tests. Here we are making sure that readMenuItems method actually reads data from the specified plist file and creates proper objects from that data. A rule of thumb while writing unit tests is not to include more than one assertion in a test method. I am violating that rule here, because it makes sense to verify that the data read from the file is correct in one place. Next add following images to the asset catalog (Images.xcassets). They are included in the finished project. Run the tests again (⌘U) to make sure that we didn’t break anything. I see some refactoring opportunity with our tests as well. Let’s move the common code from all tests into setup method. var metadata: [[String : String]]? I realized that we forgot to add a test for a scenario when the plist exists, but readMenuItems is unable to read it perhaps due to bad data. I will leave that as an exercise for you my dear readers. A menu item must have a title. Therefore, we need to make sure that MenuItemBuilder returns an error if the title is missing. We also need to make sure that an empty list of menu items is returned when an error occurs. In above test, instead of using the real menu items metadata reader (MenuItemsPlistReader), we are using a fake one called FakeMenuItemsReader. The reason for that is we need to isolate the class under test from all other components in the app. By doing so when a test fails, we can be reasonably certain that the issue is in the class under test and not someother class that it depends on. Furthermore, if we used the real metadata reader in our tests and if that class decides to download the plist from a remote server in the future, the tests for MenuItemBuilder will suffer unnecessarily if the download takes a while. We should always aim towards speedy and non-brittle tests that are easy to maintain. menuItem["title"] = "Menu Item 2"
One concern that often arises with these fake classes is that they might go out of date if the public API of the original classes they are standing in for change. It’s a valid concern. However, since Swift throws a compile time error if a class that claims to conform to a protocol doesn’t actually implement the required methods, we don’t need to worry about it here. For example, if we decided to return a non-optional array of menu items from the readMenuItems method in MenuItemsReader protocol we will be forced to apply that change to both MenuItemsPlistReader and FakeMenuItemsReader classes. Go ahead, try it. Isn’t Swift great that way? If you would like to learn more about an “alternate universe” these fake objects might create in your tests with specific examples, please read chapter 9 (Creating Test Doubles section) from Practical Object Oriented Design in Ruby book. The other concern with fake classes is that they might be giving us a false sense of security. How do we really know that MenuItemsPlistReader and MenuItemBuilder work well together? The answer is we don’t, at least through unit tests. The job of making sure that different units of an app work well together is usually given to integration tests, which won’t be covered in this blog post. We have written just enough code to make the error tests pass. Next we need to make sure that the builder creates correct number of menu items. Add following test to MenuItemBuilderTests class. One feature I particularly like about Swift is that I can easily ignore a return value that I am not interested in by using _. Following modification to MenuItemBuilder class should make all tests pass. 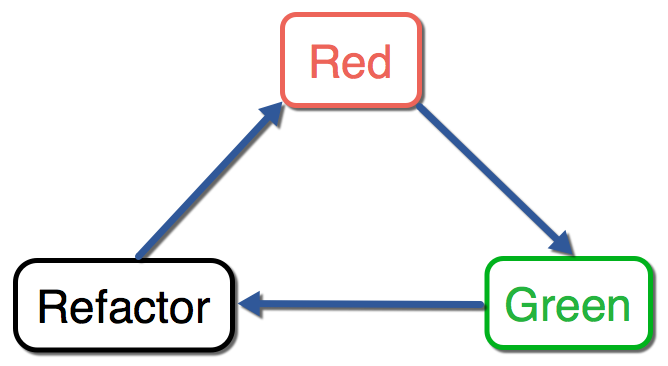 You might have noticed that I didn’t strictly follow the red-green-refactor cycle with above changes. I should be extracting the error building code into a separate method only after all tests are passing. Although, I don’t encourage ignoring the write minimum amount of code to pass tests first rule from TDD, I will be doing exactly so every now and then so as not to make this blog post too long. The last test for MenuItemBuilder is to verify that it populates the menu item instances’ properties with values present in metadata dictionaries. Once again, we are using multiple assertions within a test here. The test above should pass without any code changes. Now that we have a way to build MenuItem instances and populate them with information present in a plist, let’s move our focus to displaying their content. We will be using a table view to display the menu items. 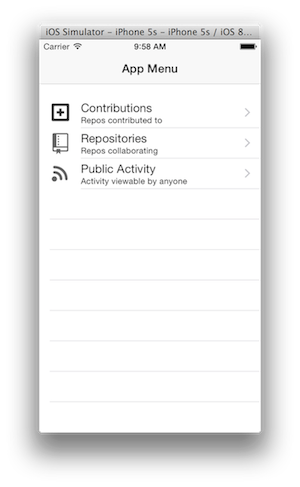 As our initial design suggests, MenuTableDefaultDataSource will be responsible for providing a fully configured UITableViewCell for each menu item. The table view itself is managed by MenuViewController. MenuTableDataSource is a protocol that inherits from UITableViewDataSource. It also introduces a required method named setMenuItems. Now we are ready to write tests for MenuTableDefaultDataSource. Create a new test file named MenuTableDefaultDataSourceTests.swift in AppMenuTests target and replace its content with following. Here we are verifying that the data source creates one table view cell instance for each menu item. Now create a new Swift file named MenuTableDefaultDataSource.swift and replace its content with the code below. Although we haven’t written tests for tableView:cellForRowAtIndexPath: method yet, we need to implement it in order to run the previous test. It happens to be a required method in UITableViewDataSource protocol and Swift won’t compile MenuTableDefaultDataSource without it. One other thing you might have noticed about MenuTableDefaultDataSource is that it inherits from NSObject. The reason for that is in order to conform to UITableViewDataSource protocol, it needs to conform to NSObject protocol as well. An easy way to accomplish that is by making it a subclass of NSObject which already conforms to the NSObject protocol. In above test, we are cheating by returning 1 from tableView:numberOfRowsInSection: method. Add one more test to verify that the data source always returns correct number of rows no matter how many menu items are present. Return menuItems‘s actual count instead of a hard-coded value of 1 to make the above test pass. Return 1 from numberOfSectionsInTableView method to make previous test pass. Although this method is not required by UITableViewDataSource protocol and the default implementation already returns 1, we need to implement it in order to be able to call it from the test. One other test I would have liked to write is to verify that the data source throws an exception if asked for number of rows in a section whose index is anything other than 0. However, I couldn’t find our old friend XCTAssertThrows in Xcode 6 version of XCTest. I don’t know how else to verify that an exception was thrown. Following changes to tableView:cellForRowAtIndexPath: method should make the previous test pass. Let’s refactor the tests for MenuTableDefaultDataSource we have written so far by extracting the common code into setup method. As it turns out our table view setup is fairly simple. Therefore, it makes sense to use the same object as a data source and a delegate. When a table view cell is tapped, the data source will post a notification. MenuViewController (or any other class that is interested in that notification) can then query the notification to find out which cell was tapped and take appropriate action. This design is somewhat inspired by chapter 9 from Test-Driven iOS Development book. Let’s add the delegate related details to MenuTableDataSource protocol. Now we need to verify that the data source indeed posts a notification when a menu item is tapped. Following tests will do that. In setup method, we added the test class to be an observer for a notification with name MenuTableDataSourceDidSelectItemNotification. When that notification arrives, didReceiveNotification: method should get called. The notification object passed to that method is stored in postedNotification variable. Then we verify that it has the correct name and menu item instance. It is important that the test class is removed as an observer in tearDown method. We go through this complex process to verify that a notification is indeed posted because NSNotificationCenter doesn’t provide an API to query if a notification has been posted to it. In Building Menu Items section I recommended that we use fake objects in tests. However, I am using NSNotificationCenter class straight up in above tests. Generally, I don’t use stand-ins for objects provided by Apple frameworks. They are fairly reliable in terms of stability and speed. That being said, if it turns out that the reliability of your tests are going down due to the use of real objects provided by Apple frameworks, don’t hesitate to create test replacements for them. Implement tableView:didSelectRowAtIndexPath: method from UITableViewDataSource protocol in MenuTableDefaultDataSource class to make above tests pass. MenuViewController will be responsible for managing the table view and any other views that might need to be createed in order to present the menu. The first thing we need to make sure is that we can give it a data source. We also need to ensure that it has a title and a table view. Create a new test file named MenuViewControllerTests.swift and replace its content with following tests. Instead of using a real data source object here, we are using a fake one named MenuTableFakeDataSource. Create a new Swift file named MenuTableFakeDataSource.swift in AppMenuTests target and replace its content with following. All MenuTableFakeDataSource does is provide stub implementation of all the required methods in MenuTableDataSource protocol so that it can stand in for any object that conforms to MenuTableDataSource. Now create MenuViewController class (Right click AppMenu group > New File > iOS > Source > Cocoa Touch Class). Make it a subclass of UIViewController and select the Also create XIB file checkbox. Don’t forget to add it to both targets. The tests above should pass just by declaring two properties and assigning a title. Change the size of main view in MenuViewController.xib to iPhone 4-inch from Simulated Metrics section in Attributes Inspector. Set the view’s orientation to Portrait. After that add a table view as the main view’s subview. Connect the table view in XIB to the tableView outlet in MenuViewController class. 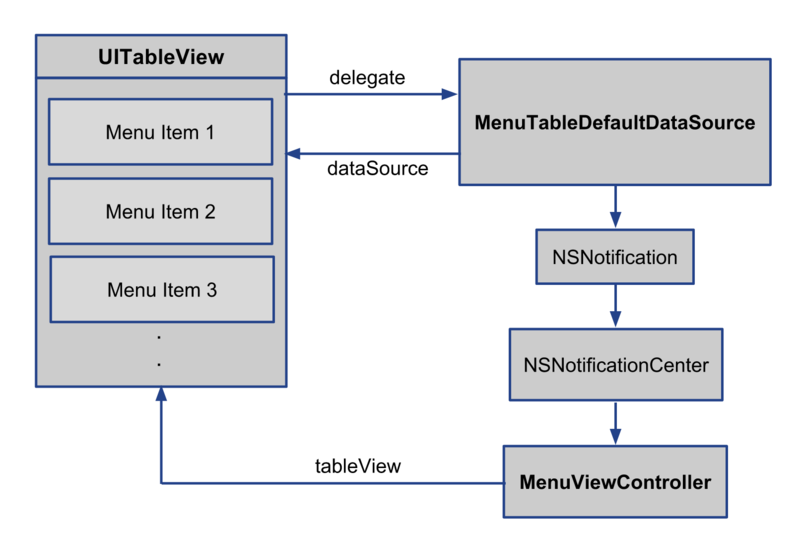 Next we need to make sure that MenuViewController sets the table view’s delegate and dataSource properties to the data source object we assigned to it. viewDidLoad method is where we want it to make that connection. Following tests should ensure that. Set table view’s data source and delegate properties in viewDidLoad to make above tests pass. In Handling Menu Item Tap Event we made MenuTableDefaultDataSource post a notification when a menu item is tapped. MenuViewController needs to listen to that notification in order to show a correct view for that menu item. If that notification arrives when MenuViewController’s view is hidden, it should ignore it. Therefore, it should register for that notification in viewDidAppear: method. It should also stop listening for that notification in viewDidDisappear: method. Let’s capture that requirement through tests. That is a lot of code. Let me explain. In order to verify that MenuViewController registers itself to listen for MenuTableDataSourceDidSelectItemNotification, we need to somehow get hold of the method that gets called when that notification arrives. Once we get hold of it, we need to capture the notification passed to that method and verify its existence. We could simply make a non-private property for that notification in MenuViewController, but I don’t like that approach. MenuViewController shouldn’t be forced to expose something just because tests need it. There has to be a better way. How about we swizzle the notification handler during runtime by providing a different implementation that is suited for our testing purpose? Following code will do just that. All we are doing here is assign the notification to postedNotification constant so that we can evaluate it in tests. In testRegistrationForMenuItemTappedNotificationHappensInViewDidAppear after we swizzle the notification handler, we call viewDidAppear, post a notification and verify that postedNotification is not nil. Whereas in testRemovesItselfAsListenerForMenuItemTappedNotificationInViewDidDisappear, we first call viewDidAppear so that MenuViewController registers for the notification. After that we call viewDidDisappear and post a notification. This notification shouldn’t reach to MenuViewController as we expect it to remove itself as an observer from NSNotificationCenter in viewDidDisapper method. To make the tests pass, all we need to do is register and unregister for the notification in proper places. When a menu item is tapped, we need to display a view. But which one? How about we ask the menu item itself? To keep things simple, let’s store the view controller’s name in tapHandlerName property in MenuItem. It’s perfectly fine for a menu item to not have a tap handler. Therefore, we should make the tapHandlerName property an optional. Now that we have added an additional property to MenuItem, we need to adjust menuItems.plist, FakeMenuItemsReader, MenuItemsPlistReaderTests, MenuItemBuilderTests, and MenuItemBuilder. The adjusted code is listed below. Next up we need to make sure that MenuViewController displays the correct view when a menu item is tapped. Following tests will do just that. Let’s make MenuViewController push the right view controller into app navigation stack. We also need to create tap handler classes. Create following view controllers and add them to both AppMenu and AppMenuTests targets. Don’t forget to also create a XIB file for each one of them. I am not quite sure what’s the best way to do that in Swift. In Objective-C you could easily accomplish that with following code. Unlike Objective-C, Swift requires you to specify which XIB file to use when you create an instance of a view controller even though the XIB name is the same as the view controller’s class name. Therefore, simply calling the alloc, init equivalent in Swift isn’t sufficient. Unfortunately, that still doesn’t make the tests pass. It turns out that so far we have built every class we initially set out to build except AppMenuManager. Once that class is built, we should be in a position to make above tests pass. Let’s get to it. Create a new test file named AppMenuManagerTests.swift in AppMenuTests target. Add following tests to it. let errorMessage = "Fake error description"
AppMenuManager is responsible for creating MenuViewController if MenuItem objects were created successfully from the metadata. If not, it just returns nil. Since AppMenuManager mostly coordinates the interaction between various objects rather than doing the work itself, we also need to make sure that it passes the metadata (if read successfully) to the builder. You might have noticed that we are using fake menu items reader and builder objects here so that we can control what gets returned to app menu manager in tests. We built a fake menu items reader in Building Menu Items, but it doesn’t provide a way for us to set the error. Let’s take care of that. Next we need to create FakeMenuItemBuilder class. Now that there is going to be more than one class playing the role of a menu item builder, we should create a protocol to make it clear what it means for a class to become a menu item builder. For now, playing that role means implementing buildMenuItemsFromMetadata method correctly. Listed below is the new protocol. Wait a minute. Didn’t we already name our real builder class MenuItemBuilder? Yes we did. MenuItemBuilder name is better suited for a protocol. Let’s rename the original builder class to MenuItemDefaultBuilder. We also need to adjust tests to use the new name. Finally, here is what the FakeMenuItemReader class looks like. You don’t need to add this class to the AppMenu target since it’s only used in tests. It makes the metadata passed to it available for inspection. It also allows us to set the error and menu items we want it to return which is very convenient. Now we are ready to build the AppMenuManager class. Here is what it looks like. I apologize for not staying true to the read-green-refactor cycle here. I wanted to focus more on important techniques that make writting tests a bit easier rather than showing you every single step in the process. One of those techniques is creating fake (or test double) objects that play the same role as the real objects so that we can easily swap them to make our tests more maintainable. Speaking of fake objects, Martin Fowler has written a great post on the topic. Before we move on, I would like to emphasize the importance of Dependency Injection in writing testable and reusable classes. 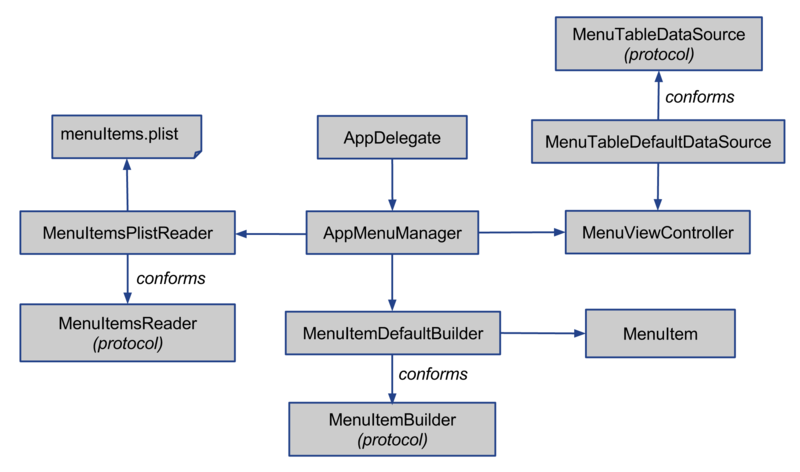 Our AppMenuManager class needs to work with two other classes that conform to MenuItemsReader and MenuItemBuilder protocols to successfully create MenuItem objects. Had we not exposed these two dependencies via public properties, we would not have been able to pass in fake objects. Those fake objects came very handy while setting up the desired test scenarios in order to verify that AppMenuManager behaved as expected. Therefore, I recommend exposing every single dependency your classes have unless those dependencies are classes provided by Apple frameworks. We are almost there. Now that we have built every class, let’s put them together in AppDelegate. But first we will write some tests to verify that AppDeleate behaves as expected. Create a new test file named AppDelegateTests.swift in AppMenuTests target. Add following tests to it. In Managing App Menu, we created MenuItemBuilder protocol when we realized that we needed a fake object that could stand-in for the real menu builder. But, here we are creating fake app menu manager objects inside the tests themselves. It’s perfectly fine to do so. If we decide to rename menuViewController method in real app menu manager class, Swift will force us to modify all our fake objects to use the new method name. Because of that, all these fake objects will always be in sync with the real app menu manager. This approach comes very handy if you need to create quick fake objects inside the tests. It would be nice to extract the code that configures AppMenuManager out from AppDelegate. We are going to apply what Graham Lee taught us in Test-Driven iOS Development here and create our own dependency injection class instead of using a full blown depdendency injection framework. AppMenu is a simple app, at least for now. So we shouldn’t be adding dependencies to it unless we need them. Create a new test file named ObjectConfiguratorTests.swift in AppMenuTests target and replace its content with following. Create the ObjectConfigurator class and add it to both targets. Replace its content with following. Instead of creating an AppMenuManager object itself, app delegate will tell the object configurator to do so. Let’s make changes to AppDelegate and its tests to include the new approach. Let’s turn our attention to MenuViewController. Although, all tests for it should be passing now we need to do a little refactoring. Let’s extract the code that decides which view controller should be the tap handler into a separate class. Create a new test class named MenuItemTapHandlerBuilderTests in AppMenuTests target and replace its content with following. Let’s make the test pass by creating a new class named MenuItemTapHandlerBuilder. Add it to both targets and replace its content with following. Now that we have extracted the tap handler building code, we should inject MenuItemTapHandlerBuilder as a dependency to MenuViewController. In addition, let’s leverage the depdency injection facility we have built to configure an instance of MenuViewController as well. Let’s run the app (Product > Run or ⌘R). When each menu item is tapped, the correct view controller should be pushed into the app navigation stack. Our final app design (listed below) ended up not deviating too much from the initial design. However, it is quite possible for the final design to evolve into something completely different. In this post we learned how to build a simple iOS app using TDD. Although Xcode 6 beta is a bit unstable as of this writing, XCTest itself seems to be quite stable. Despite the lack of mocking libraries such as OCMock and Kiwi, we were able to create fake objects easily and use them in our tests. Swift’s ability to create classes inside a method came very handy while creating specialized fake objects quickly. Although Swift is a completely new language, the techniques you might have learned for testing features in Objective-C (or any other language for that matter) in the past are still applicable to Swift. We only scratched the surface of Test-Driven Development in this post. I encourage you to read the reference material listed in Further Reading section below for an in-depth examination of TDD. Hopefully, you will give TDD a try with your next iOS app. The only way to get better at designing (and testing) is by doing more of it. The finished project is available on Github.